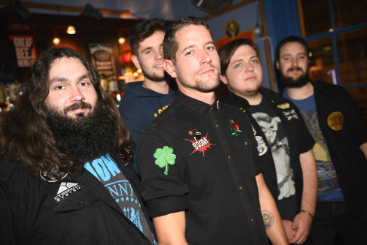 Brighton's 40 Shillings on the Drum, who are set to share a stage in Sussex with punk icons, UK Subs, later this month, say they also share the same ethos when it comes to songwriting and live performance. "There's a strong, punk influence through a high majority of our songs and I never hold back with my own songwriting - whilst rarely political, if I've got something to say, I will," says 40 Shillings on the Drum frontman and chief songwriter, Daniel Scully. "A great example of this is in one of our most popular songs to date, 'Beggars on the Street'. "The lyrics were written off of the back of an unjust rejection from an Industry-type, and if you dig into the words, it's brutally honest." The five piece have been going from strength-to-strength since they lived up to their punk credentials by self-funding their own UK tour. But it will be sharing the Lewes Con Club stage with UK Subs, on Sunday 11th November 2018, that 40 Shillings on the Drum and their expanding fan base are most looking forward too. Scully continues: "To be given the opportunity to support punk legends UK Subs on a date of their tour by the promoter the Big Blue Shed is both a great opportunity for the band, and an honour. "They were a part of the first wave of punk and it's because of them, bands like 40 Shillings on the Drum exist. "It's a tough industry, and these kind of opportunities, when promoters give bands at our level a shot, is quite rare. "We're extremely grateful and will reward the Lewes Con Club attendees with a blistering set." UK Subs formed in 1976 with the band's mainstay being vocalist Charlie Harper. They can even boast a string of bonafide hit singles with the release of Stranglehold, Warhead, Teenage, and Tomorrow's Girls. Successive U.K. Subs album titles start with consecutive letters of the alphabet, and the band released their twenty-sixth album Ziezo in 2016 .. when they announced it would be their last long playing record, although they will continue to release EPs. Their latest EP, released this summer, was their first ever fully independent release. "If you're doing things right as an artist, it doesn't take too long for word to begin to spread," adds Daniel Scully. "We've been fortunate enough to have had some very good exposure throughout the life of the band, and we are getting offers, and coming up with ideas ourselves to earn us more promotion all the time. "We are interested in record labels, but we won't be making any hasty decisions." UK Subs, The Dinz and 40 Shillings on the Drum play Lewes Con Club on Sunday 11th November 2018. CLICK HERE for info. CLICK HERE for tickets.